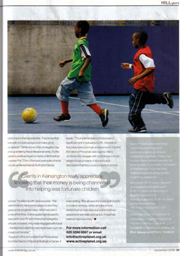 Active Planet - "Investing in People and Communities through Sport"
Active Planet & Futsal hit the Hills Magazine! 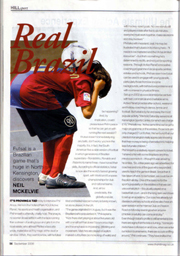 Futsal is the indoor five-a-side game popularised in South America and claimed by the likes of Ronaldinho, Robinho, Ronaldo and Rivaldo as the source of their skills. The game is played with hockey sized goals and a smaller ball with a reduced bounce. 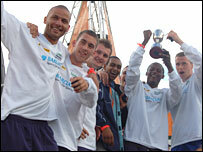 It's fast, it's fun and it's great way to improve your football skills. Birthday celebrations to suit your every need, for all children aged 3-15 years. 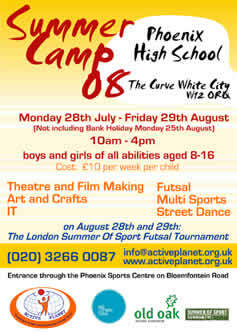 Active Planet also run Creches for events, School Sports Days, Youth Festivals and Youth Tournaments. Why not build you own coaching sessions? 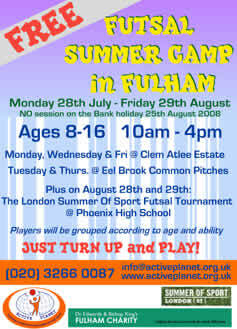 Hire a Active Planet coach for an hour or two, who will design a fun, football coaching programme specifically for your children. All our coaches are CRB checked and appropriately qualified. Minimum amount of children required for coaching sessions is eight. You can now set up your group and register online to secure your timeslot. register online to receive our monthly newsletter.